The chair is a simple half industrial design that Wegner originally drew for Fritz Hansen who never produced it. Similar to Wegner’s earlier Heart Chair the CH20 has a solid wooden top rail machined from a single piece of timber. The simple construction contain the chairs proportions within the footprint of the seat. It is a strong practical chair that is stackable. In 2005, the British architect John Pawson was commissioned to design the hotel foyer, reception and meeting areas of the Hotel Puerta America in Madrid. The main reception space was to be used for conferences and banquets seating up to 900 covers. Pawson suggested the comfortable PP 58 chair from PP Møbler. However as the space required a chair that stacked the use of the three legged version PP58/3 in such a large numbers was a concern to ourselves and the Wegner Studio over using a chair with only three legs. by her father, a little stacking chair designed but never produced by Fritz Hansen, for a large project we were working on with Getama in Central London. The original Fritz Hansen stacking chair designated xx15 first proposed by ourselves for a project in 1994. It was clear that this four legged stacking chair may provide a solution for the large banquet hall and it was presented to John Pawson’s design team. Following a favourable reaction it was proposed that the new large industrial factory Carl Hansen had moved to in 1998 was the most cost effective of the Wegner producers for the project and Marrianne introduced the design to the new CEO of Carl Hansen Knud Erik Hansen. Sadly, the chair code named at that time as XX15, although proto typed and presented to the Hotel by the architects was not chosen for the project as a metal framed chair was seen as more suitable for the environment. 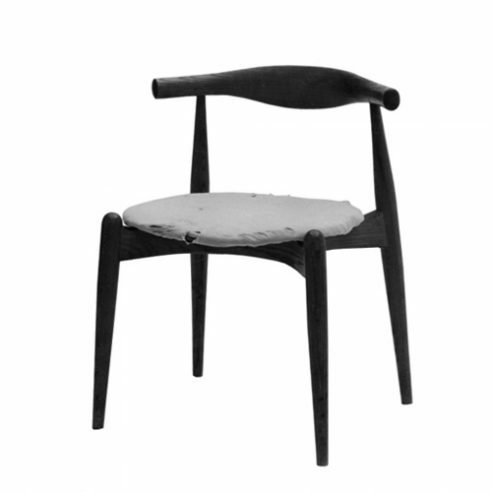 However, the work between ourselves and the Wegner Studio on this project was to see XX15 go into production as Knud Erik Hansen was so impressed with the design and prospect of an order for 900 chairs he decided to add it to the Carl Hansen collection as CH20 – known today as the”Elbow Chair”.